The line-up of No More Tears (1991) consisted of Zakk Wylde (guitar), Mike Inez (bass), and Randy Castillo (drums). Bassist Bob Daisley was also involved in the recordings. Lemmy Kilmister co-wrote several songs on the album, namely Hellraiser, Mama, I’m Coming Home, Desire, and I Don’t Want To Change The World. Still, there is no big Motörhead influence to be heard. The opener Mr. Tinkertrain has lyrics that deal with child abuse, though not as openly as in Motörhead’s Don’t Let Daddy Kiss Me. I Don’t Want To Change The World has a stomping rhythm and sleazy guitars. Mama, I’m Coming Home was a huge radio hit and shows Zakk Wylde’s southern influences. Desire has a straight hard rock feeling and a very LA-style chorus with a reference to an older song: “It’s the same old desire / Crazy train, crazy train.” The title song has a bass and keyboard intro that could almost be part of a Saga song were it not for the slide guitar. Again, we get some more Stevie Ray Vaughan elements in the verse. S.I.N. has a dramatic opening and a chorus in the vein of classic AOR. Hellraiser has nothing to do with the movie of the same name, but the song is not very convincingly written and has a chaotic middle part. Time After Time is a semi-ballad, but weaker than Mama. Zombie Stomp begins with some bass notes, drum rolls and congas. The lyrics deal with addiction in general and its consequences. 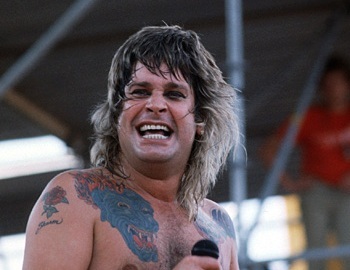 The song’s staccato riffing is unusual for Ozzy, but the chorus sounds more traditional. A.V.H. once again has a southern style intro, but soon goes up-tempo. The listener notices the train metaphor for the second time: “Riding on a train that I can’t control”. Road To Nowhere is reminiscent of Guns n’ Roses on Appetite For Destruction. This reissue features the two bonus tracks Don’t Blame Me and Party With The Animals, which are OK.